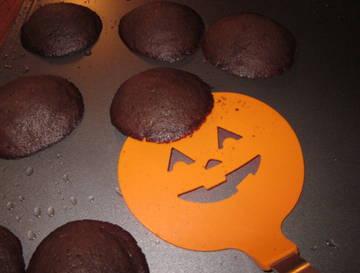 This entry was posted on Friday, October 29th, 2010 at 4:00 am	and is filed under Cookies and Bars, Holiday Foods. You can follow any responses to this entry through the RSS 2.0 feed. You can leave a response, or trackback from your own site. 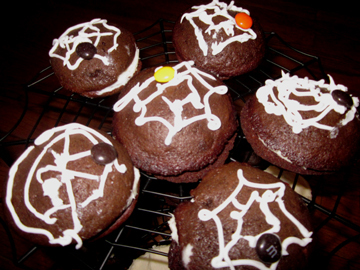 YUM~to do an easy spider web, just make a coil of frosting, rolled up like a snake, and then drag a toothpick out from the center–that is the easy way to make the web pattern. 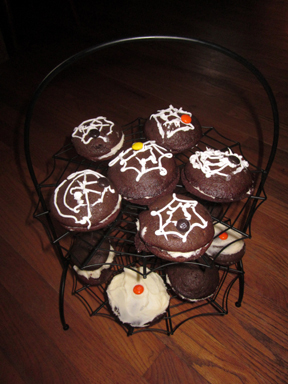 I’ve never had a whoopee pie and think I’ll have to remedy that soon. These look like so much fun! Whoopee Pies looks great! Do you know how the pies got their name? Just curious. And I like Truffle’s costume. So glad she didn’t go as Lady Gaga. Too many Gagas this Halloween. Good question, Martha. I always assumed it was because they made the eater say “Whoopee,” which is certainly what one web site claims. I’m not 100 percent sure about that. Meanwhile, Truffle thanks you and agrees about Lady G. She’s more a Shirley Temple type. Laurie, I’m not sure even your method would work for my clumsy fingers, but I’ll give it a try. Abigail, do make them. Your daughter will thank you! I’ve never heard of whoppee pies – but they look good to me! 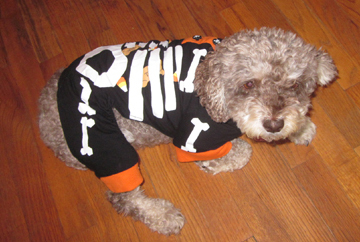 And Truffle looks gorgeous in her costume! Thank you, Frayed! The white parts of Miss T’s ensemble glow in the dark so I can find her if she goes trick or treating. These are adorable! I’ve never made whoopee pies but now I know where to turn if I ever get the urge-thanks! It’s not an urge I get very often myself, EveryDay, but luckily, my neighbor Alice just happened to have a whole bunch of students coming so the calories weren’t too devastating to me personally!